The Lady of the Manners has been all sorts of scattered, Snarklings, and before she realized it, the holidays were looming close. Which, around the Gothic Charm School household, means baking a very specific type of cookie: Gingerbread bats! Very spicy, very ginger-y gingerbread bats. The Lady of the Manners doesn’t think gingerbread is proper gingerbread unless it makes your tongue tingle. You Have Been Warned! Combine the molasses and butter in a saucepan over very low heat until the butter melts. Add the sugar, minced ginger, and lime juice, stir until the sugar dissolves, then remove the saucepan from the heat. While that mixture cools, sift together all the dry ingredients. Fold the dry ingredients into the lukewarm butter/sugar/molasses mixture. Add the egg (just crack it into the bowl! ), and mix everything together until the dough is smooth and slightly glossy looking. Gather the dough into a ball, wrap up in plastic wrap or wax paper, and chill for a minimum of 2 hours. Pre-heat the oven to 325* F.
Roll out the dough on a floured cutting board, then cut out cookies with appropriately-festive cookie cutters. 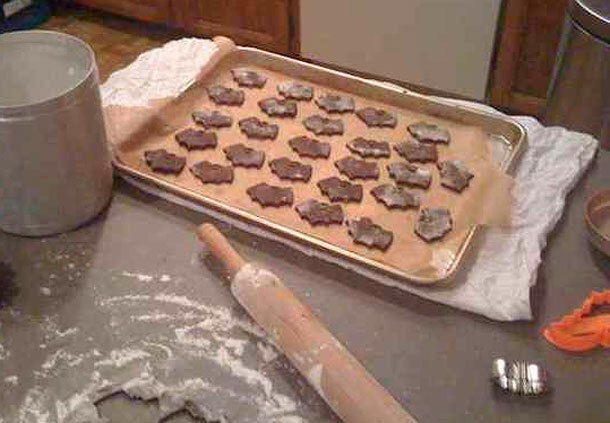 Bats, of course, are the holiday cookie shape of choice at Gothic Charm School. There you are, Snarklings! Festive gingerbread bats, appropriate for all holidays, or just because you feel like it. (They’re especially tasty with a cup of hot cocoa or chocolate rose black tea!) With that, the Lady of the Manners is off to celebrate the holidays with her loved ones, and will be back after the new year with more posts answering your questions. She wishes all of you the best during these holidays!